A bowl with potatoes in rather than pickles features on this bold and brassy green bag. It's a good design that does the job in a basic and sincere fashion - almost shouting what they are. The 0g of Trans Fats symbol adds another positive. The perfect thickness for a Chip manufacturer. Not so thin that they are brittle. Not so thick that you can't maximise a potato's Chip output. The crunch was good and solid and there were plenty of complete Chips in the bag. Some Chips had skin which provides a fresh image in the mind. Most noticeably there were flecks of green powder that left a small amount of residue on the fingers along with less grease than most. You wouldn't find a more Dill Pickle aroma when opening a jar of pickles than a bag of Barrel O' Fun Dill Pickle Chips. 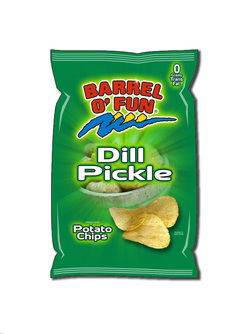 The taste was much the same; a mild but strong pickle flavor.